A number of players have linked up with clubs in the Midland League in order to maintain match fitness. 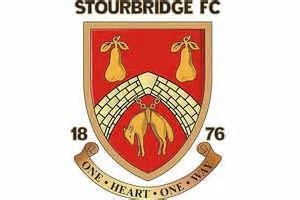 However, all remain registered with Stourbridge as Evo-Stik League players, and we will be able to call upon their services as and when required. Goalkeeper Charlie Price has joined Sporting Khalsa, defender Alex Penny is with Hinckley, winger Lewis McPike has linked up with Stourport, and midfielder Louis Harris is at Walsall Wood, for whom he has already made a handful of appearances this season. In the meantime, we can report that striker Kayelden Brown is still awaiting a scan on the long-standing knee problem that he aggravated earlier in the season, and is likely to be unavailable for some time. We can also report that Nathan Hayward has left the club. Nathan, who joined Stourbridge in the summer and made one substitute appearance in the opening day defeat at Whitby Town, was having difficulty with travelling and we understand that he has now re-joined one of his former clubs, Bromyard Town, in the West Midlands League. We wish Nathan well for the future.  Hitman Richards arrives from Sutton We are pleased to announce the signing of striker Justin Richards from Sutton Coldfield Town FC.